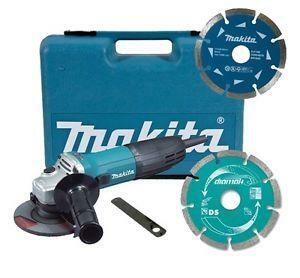 The Makita GA4530RKD is a small diameter Angle grinder with an ergonomic barrel grip. Regardless of whether the user grips the motor housing or rear cover, the slim barrel grip with a diameter of 179mm fits any user's palm and fingers perfectly. It provides easy and comfortable handling while minimizing hand fatigue and pain. Includes carry case and blades.